Pre-registration is available before August 31st, 2019. After August 31st you may register on-site at premium prices. You may register using a printed registration form and mailing in a check or online with Paypal. All meals will be on a short order basis, pay as you go ‘*CASH ONLY*. Breakfast will be offered from 7:30 a.m. to 9:30 a.m., lunch from 11:30 a.m. to 2:00 p.m., and dinner from 4:30 p.m. to 6:00 p.m. 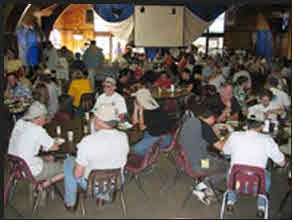 The dining hall will be kept mainly as an auditorium all day and night. Take your meal to the picnic tables out back or anywhere around the camp in the clamshell meal box you’ll receive holding your order. General admission for adults is $50 and includes entry to the conference grounds for 4 days (Thursday through Sunday) and camping for 3 nights (Thursday through Saturday nights). Meals and dormitory lodging are not included. Admission is free for children 17 and under. People coming for a single day (or any part thereof) may pay for a Single Day Admission, which is $30 for adults. Single Day Admission does not include camping, meals, or dorm lodging. Day Users arriving after 9 AM Saturday will be directed to special parking areas. Admission is free for children 17 and under. Meals are now purchased individually on a short order basis. CASH ONLY. Dormitory space is available for $20 for adults and free for children 17 and under for 3 nights (Thursday through Saturday nights). There may be some dorms assigned to volunteers or Scouts, so please check the front and back doors for a sign before setting up your space. One bathroom/shower facility is provided for each dorm. 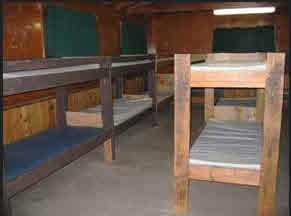 No assignments to specific dorms are made; each bunk is available on a first-come, first-served basis. There are signs denoting which are Men’s, Women’s and Family dorms. The 3-sided units with bunk beds that are open on one side are free to anyone who would like to use them. A mattress is provided, but you need to bring your own sleeping bag and pillow. Lodging is also available off-site in the city of Big Bear Lake. Click on the following links for more information. There are no picnic tables, fire pits, or marked spaces in Camp Oakes. 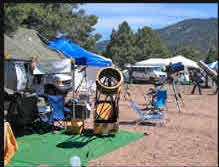 RV’s may not park on the telescope a field or in a way that will impede traffic or damage the environment at Camp Oakes. RV and trailer owners need to be especially careful of interior lights. Please park so that doors open away from observers, block windows to prevent light trespass, and mask interior lights with red cellophane as necessary. Generators may run only from 11:00 a.m. until 8:00 p.m. RV’s are not allowed to connect to the camp electrical system. Also, there is no water supply available to fill your RV water tanks and no dumping facilities. Please bring your own water and plan to dump water or waste after you leave Camp Oakes. Not everybody sleeps at the same time. Many attendees will be observing from dusk until the wee hours of the morning. Please be courteous to your neighbors at all hours by minimizing noise. If you play music, play it quietly. On the other hand, please realize that your sleep may be disturbed by observers talking, using equipment, and in other ways as they stay up late. Locate your campsite accordingly. When you leave, please make sure your area is trash free. Please leave Camp Oakes better than you found it. Outdoor carpeting under your scope and a tarp or other cover for the daytime are highly recommended to protect equipment from dust. Refunds for pre-registration can be obtained by notifying the RTMC Registrar NO LATER than Monday, September 9th. Paypal service fees are not refundable. Refunds will not be given for weather-related issues.